The junker hunt for treasure continues! After a solid Saturday of NJ's finest offerings, the next day Jess and I decided to visit another local flea market - the Dover Flea Market. The website made the place look ridiculously hokey, like it was designed by a retired 1950s circus clown. The market was hailed as one of the better Sunday fleas in the area. The silly website, enticing reviews, and its location by a train station was making the spot seem legendary. We obediently followed the GPS to the flea's location. As we approached, I expected to see the livelihood of market moving about like a well-oiled machine. But, there was nothing. No vendors. No shoppers. No flea market at all. After looking at the (hilarious) website once again, we realized it was dated from 2016. 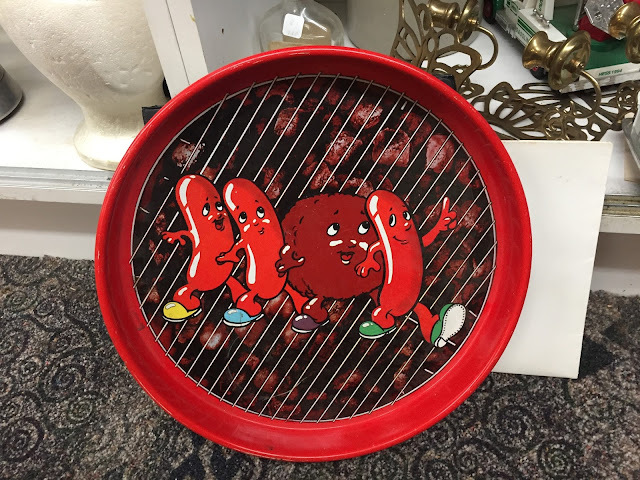 Flea market fail! Our mission for more junk was crashing and burning. We were annoyed, slightly embarrassed, but most of all, completely bummed. With our plan scrapped, we parked the car and brainstormed how to salvage this adventure. None of our ideas mustered up much excitement. 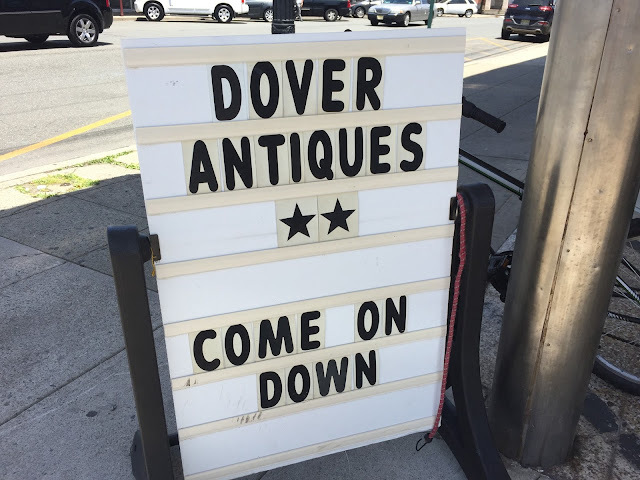 We were about to call it quits, but a block away we spotted something that perked us up - a dinky sign for an antique store! One measly shop can't compare to the grandeur of a flea market, but it was enough to raise our spirits from defeat. As we got closer, the place looked uninspiring and dull. Through the window, there were a couple of furniture pieces and some artwork. My enthusiasm was plummeting. We entered with little hope, expecting to turnaround immediately. But then a funny thing happened. 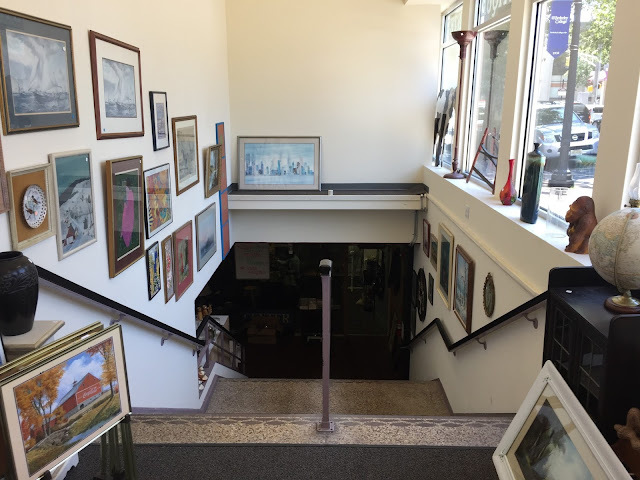 There was a mysterious staircase leading into a dimly lit basement, a passage that called out to me. The outlandish entrance used its mystique and grabbed my curiosity. Weird entrances always do this to me! I felt like a pathetic, hungry dog staring at its master eat dinner - I wanted to know what this was all about! Step by step, I made my way down the staircase. The suspense was fun. I was truly captivated, even if I didn't expect much. But then I got a glimpse. As the view opened up, I saw never ending shelves holding treasures as far I could see. It was like this basement had a never-ending horizon. The view seemed infinite. I was in awe, so much cool stuff! I suddenly realized the scene was so overpowering I had stopped walking just to take it all in. 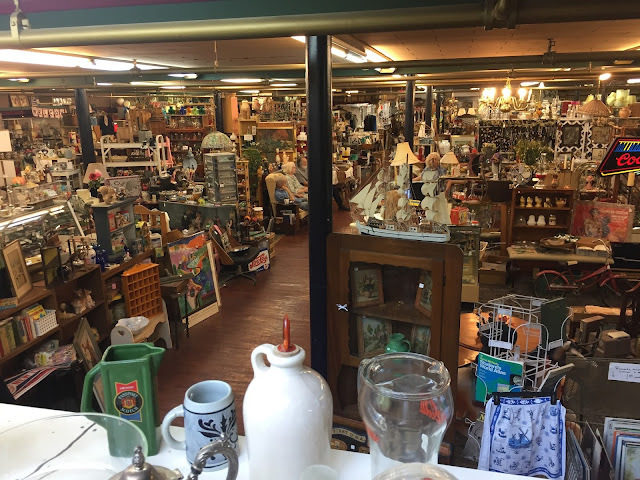 It was like seeing the Grand Canyon of antique stores. Each area had its own vendor. Instead of paying at one register, all the sellers huddled in a bullpen-like area, seated in a collection of chairs. If they saw people in their respective areas eyeing their goods, they would get up from the bullpen and assist the customers. For me, it was a new experience. 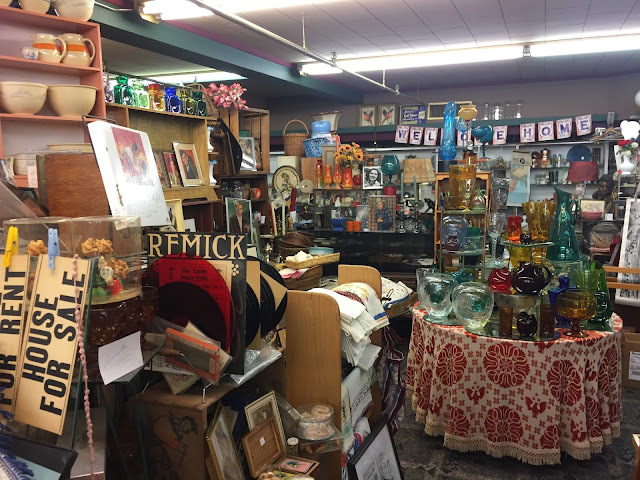 Paying a different vendor in each spot of the store was more like a flea market and less like an antique store. But, this only added to the mystique of the place. The place was so big it was tough picking a starting point. Intuition landed me in spot loaded with toys. From floor to ceiling, there was eye candy everywhere. I stayed in this space for over 20 minutes and explored everything it had to offer. 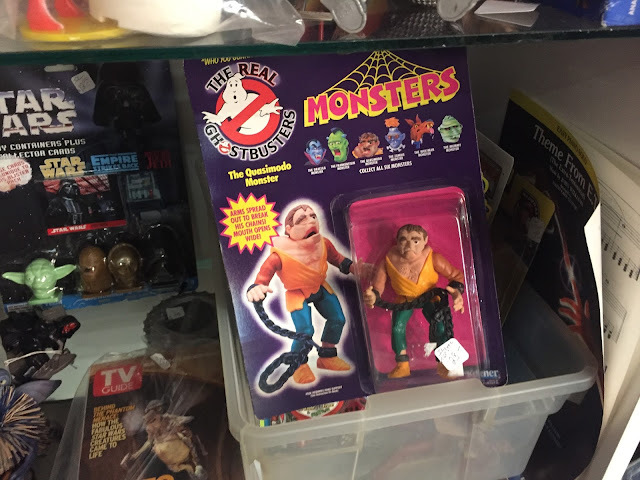 The first item I spotted was an unopened Quasimodo Ghostbusters figure still in its packaging. This was the same toy I bought at the flea market the previous day! The figure here at the antique store was in much better condition. But for an asking price of $28, I think my $1.50 price point at the flea market was much better. Original packaging is cool, but not $28 cool. There was a surprising amount of TMNT on display too. The prices were much more reasonable for these items, which was a bummer because most of the stuff being showcased I already had. That didn't stop me from having fun discovering all of the items. Let's look at a few highlights. Bottoms up! 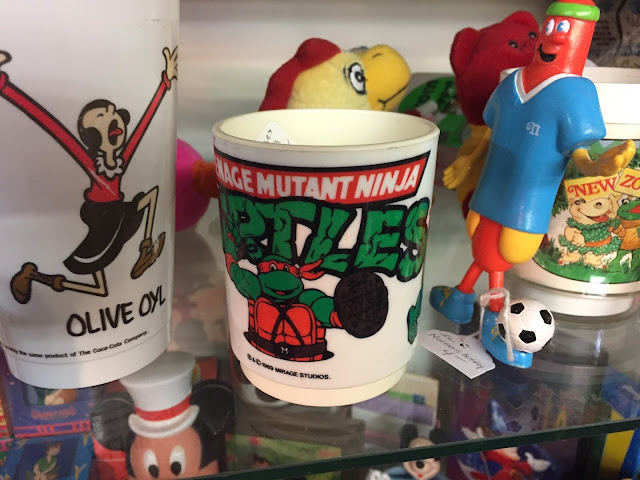 A classic plastic mug for you juice, coffee or pizza in a cup. 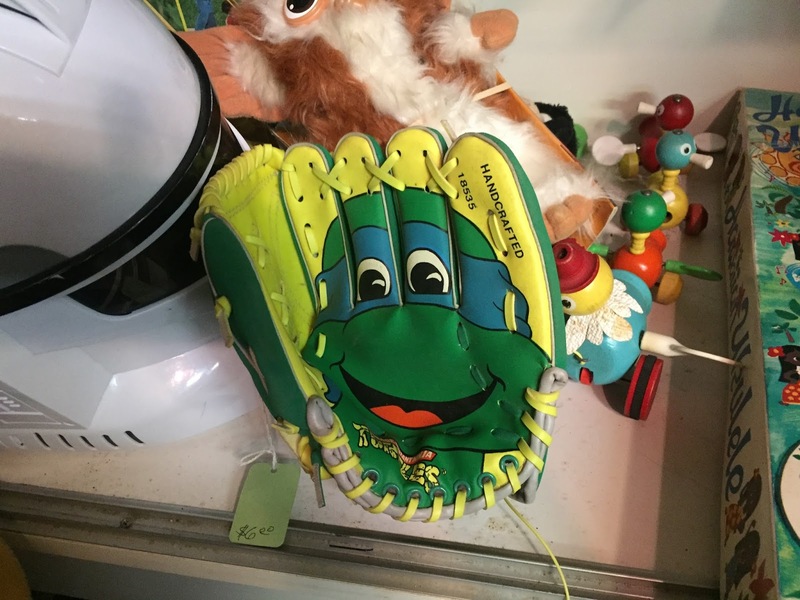 A Leonardo baseball glove for a five dollar piece. MVP, dude. Be the coolest kid in the cafeteria with a classic lunch box for eight bucks. Pack a VHS inside for an additional five. 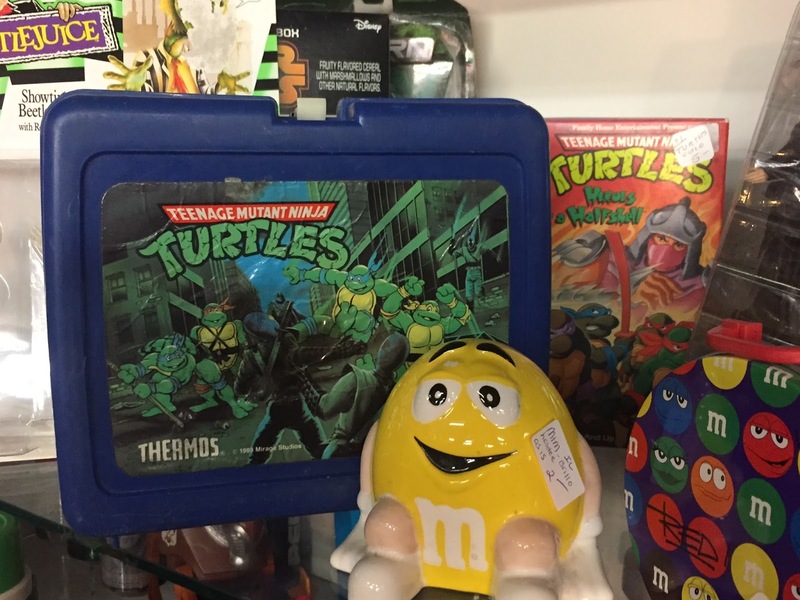 In addition to all the TMNT gear, there was a bunch of other awesome toys. 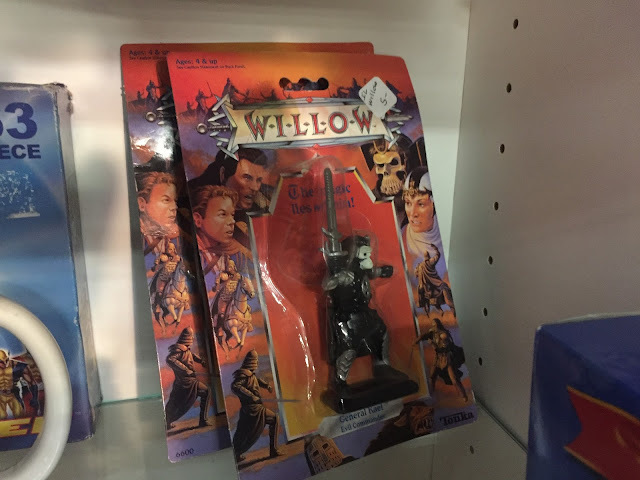 Near the Turtles lunchbox was a set of Willow collectibles. The Warwick Davis fantasy flick might have been a flop when it was released in theaters, but I always loved it as a kid. Call me crazy, but I find it much more entertaining than any Lord of the Rings movie. Even with all this wild praise I'm giving the movie right now, I still didn't buy the collectibles on display at the store. Seeing them on the shelf was good enough. I guess my Willow fandom only runs so deep. On the next shelf over I found another unexpected discovery, straight from Pee-Wee's Playhouse. It was Ricardo! He was Pee-Wee's soccer-obsessed pal, in case you haven't watched the show in ages. The figure was in its original packaging and in great condition. It had been years since I'd seen a Pee-Wee figure like this, so I stood there like a weirdo and studied it for a good five minutes. The toy itself was pretty dull, but that packaging! The artwork was exquisitely 80s and completely mesmerizing. If I wanted to see everything else in this antique store, I had to move on from staring at this Pee-Wee toy. 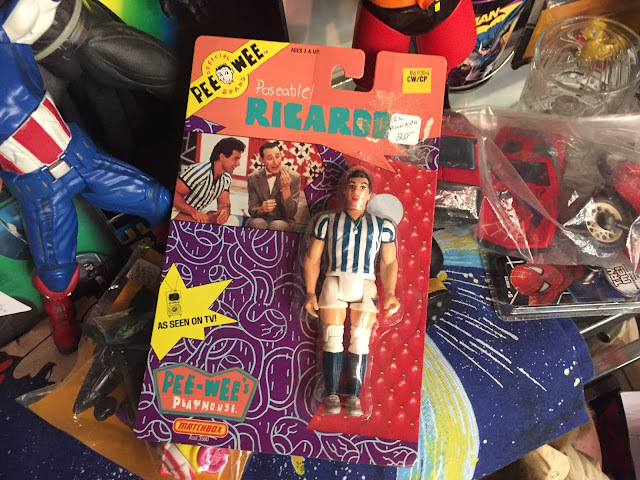 I peeled my eyes away from the soccer-loving Ricardo and continued my journey through the store. 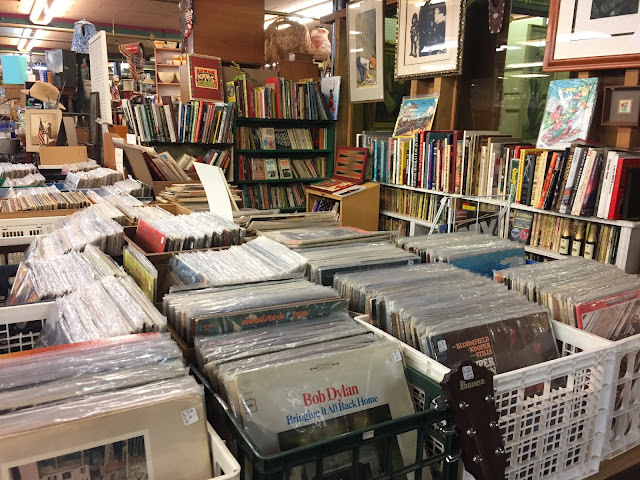 I barely moved in the store and found myself in a makeshift library of vintage literature and records. The collection of books was especially impressive, organized in a way that made sense to someone, but not me. I searched through the musty paper for something that caught my eye. Small paperbacks are my favorite. They display well and are perfect to shove in your back pocket for reading on-the-go. I was hoping to make a few discoveries in this chaotic collection. Every genre was here. The seller had it all, from pulp novels to the classics you're forced to read in school. 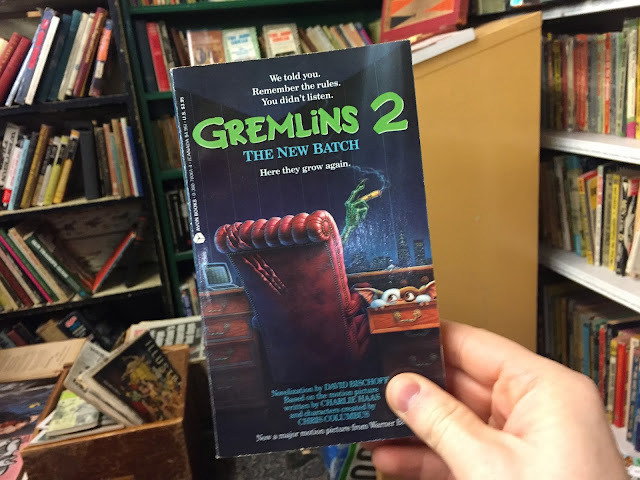 I laughed out loud when I spotted a movie novelization of Gremlins 2 wedged between a copy of Swiss Family Robinson and a Mike Hammer novel. Why did the seller have this book?! It seemed so random. Little did I know, this was just a gateway drug into the rest of the collection. There were loads more terrible (yet amazing) movie novelizations and other wacky publications I never knew existed. I spent an embarrassing amount of time in this section of the store. From the books to the records, I bounced back and forth like a madman. The old, bearded seller watched me with a curious eye. But through his glasses, I could see his excitement. He could see my enthusiasm, and he was feeding off it. In the end, we bought four books and three records for a whopping $15. 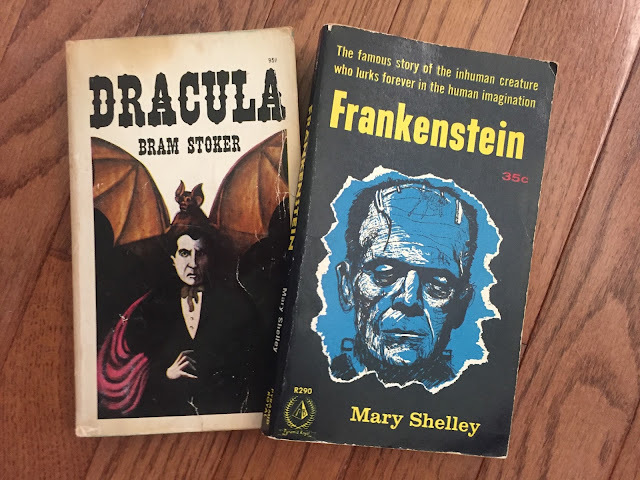 Since reading both Frankenstein and Dracula during the Halloween season years ago, I somehow found myself starting to collect cool copies of each book. It's a small hobby that I put no effort behind. If I see a neat-o cover for a cheap price, I buy it. At the antique store, I saw copies of both books. 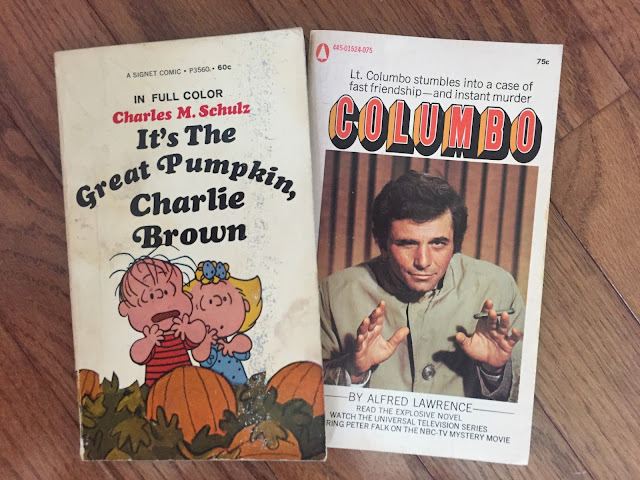 Jess also found a small paperback of It's The The Great Pumpkin, Charlie Brown, so we added that to our growing Halloween-inspired collection. And then there's a Columbo book, based off the old-school detective show of the same name. My Dad is a diehard fan who loves the show and owns all the DVDs. I bought it as a fun Father's Day gift for him to celebrate his passion for the glass-eyed, trench coat-wearing detective. We scooped up the vinyls mainly for their classic artwork. 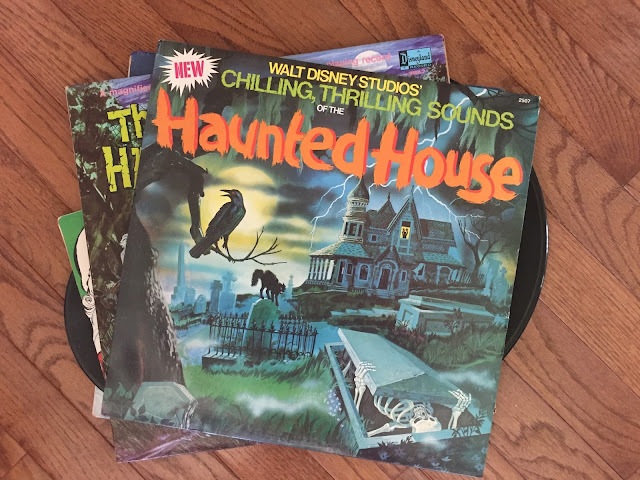 The Chilling, Thrilling Sounds of the Haunted House album is so cool it hurts. Besides having the best name ever, the record is perfect for display during the Halloween season. The skeleton coming out of the coffin is just how I feel when summer is coming to a close and October is near. Boo! 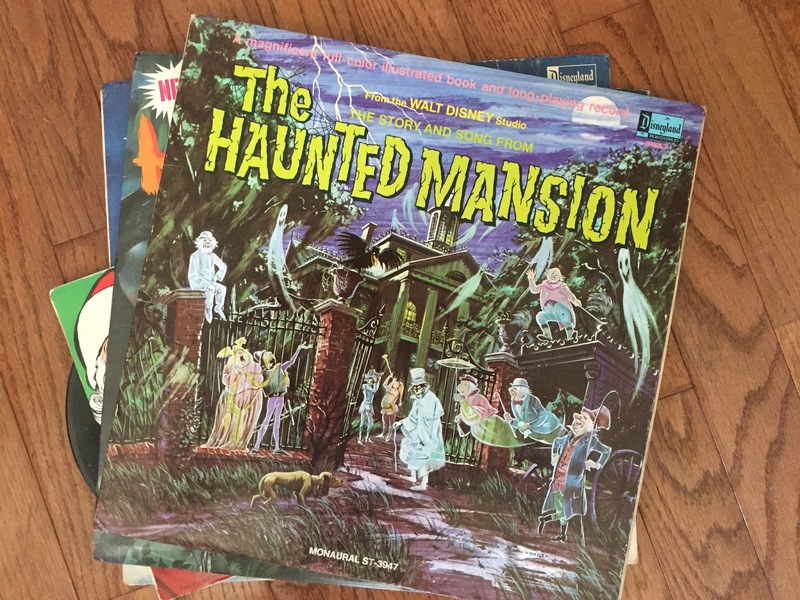 Another spook-tacular vinyl! 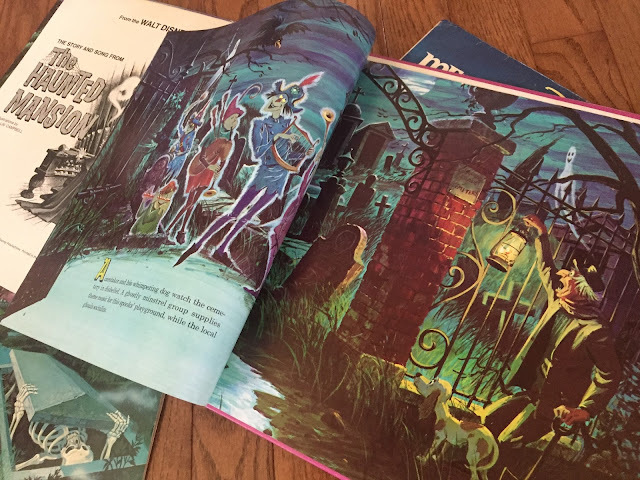 Disney's The Haunted Mansion is a winner with its rich, vibrant cover art. Although October is months away, the antique store was priming me for the Halloween season. The album opens up like a book, with a spooky story that offers more eerie illustrations. Without listening it yet, I've already logged in hours with this record. Do I really have to wait to give it a spin?! 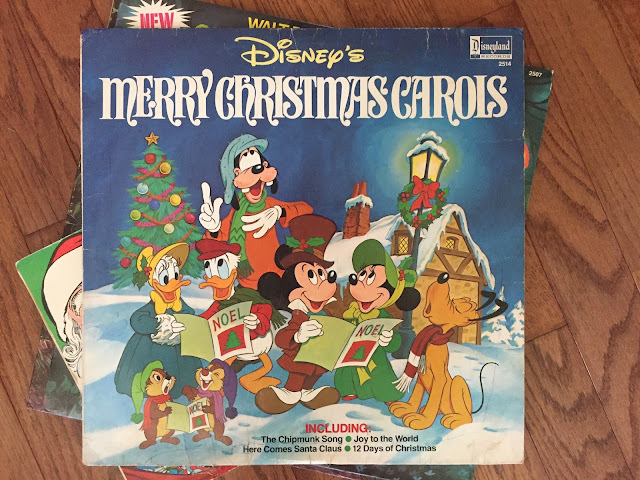 Seeing my seasonal enthusiasm, Jess jumped onboard by grabbing Disney's Merry Christmas Carols. I'm not sure if she wanted it for listening or decorative purposes, but it was a cheap purchase worthy of either scenario. Like the Halloween albums, this will be a fun one for later in the year. The last vinyl was a freebie from a different spot in the store. The seller was a sweet, older woman who appreciated my enthusiasm more than making a buck. I found this little record buried with a stack of vintage magazines. It was trapped there, and probably hadn't seen light since the Reagan administration. 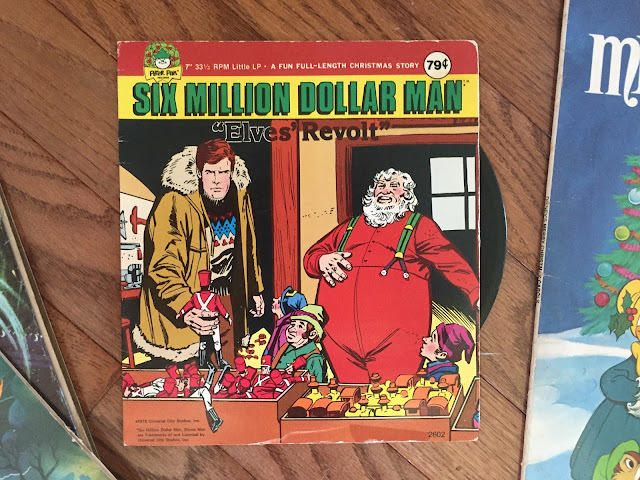 The condition certainly wasn't its best attribute with a steady amount of scratches, but the holiday-themed 6 Millions Dollar Man 7" LP has killer artwork and an unbeatable title ("Elves Revolt" cannot be topped). It's the perfect piece to put out display during Christmas. Just look at this thing. What is happening in that scene? The record is scratched to hell, but hopefully it can produce enough audible sounds to understand. It's too promising to remain a mystery, and thanks to the awesome woman who gave it to me, hopefully it won't remain a mystery for too long. I saw thousands of awesome objects in the antique store. This story could go on for years if I outlined every cool item I spotted in my search. 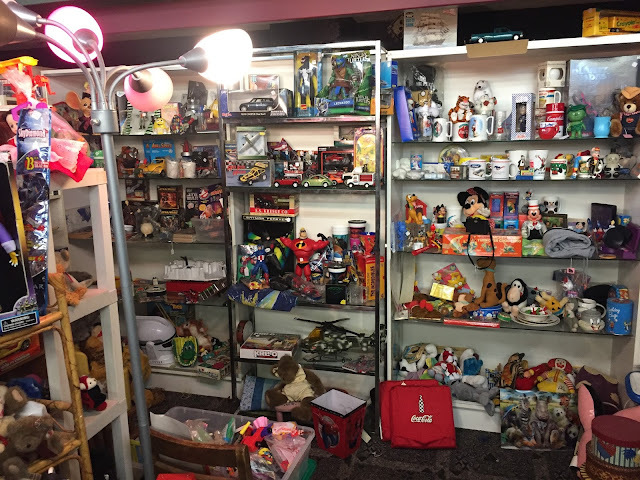 More toys, more rarities - it really was endless. Between the Meadlowlands Flea Market, Target, and this place, I saw a lifetime of beautiful junk. I emerged from this conquest like a king, hand fulls of treasure. From the cheap flea market finds to the collection of discovered antiques, my unofficial start to summer was the ultimate win. Now, when the temperatures become unbearably hot, I'll have a good excuse to stay indoors. Forget the summer sun. I've got used toys, books, and music to help me escape the heat all season long. Power on that air conditioning, order a pizza, and I'm set until Halloween! Sweet place and some great scores!! Thanks dude! I hope if I ever return, the place retains its magic. My oh my those records are so fantastic! Right?! You can't go wrong with artwork like that. That Six Million Dollar Man record is a lot like the fake movie that opens up Scrooged. Totally! And I'm into it.